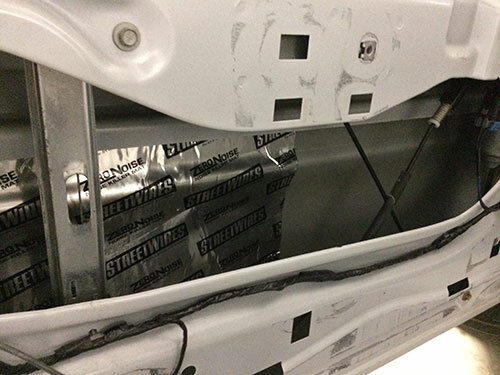 Sound deadening materials are products used to reduce the rattling in the body panels and license plates of a vehicle. A person might think, “I don’t want to deaden the sound of my audio system,” but sound deadening products actually improve the quality and SPL of your system. Vibrations generated by speakers that travel through air create sound. High performance speakers and subwoofers are able to control those vibrations so they can be heard accurately creating high quality sound. Any uncontrolled vibrations coming from door panels, trunk lids, and license plates reduce the quality of sound you hear because your ear cannot separate the noise from the music. 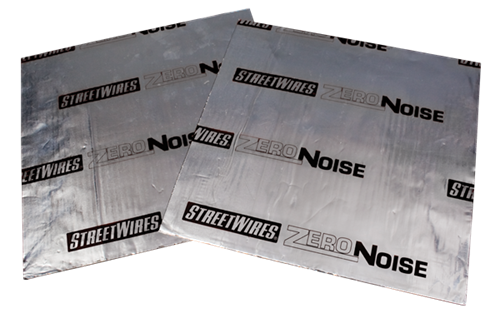 Sound deadening materials can also reduce road noise from entering the inside of the vehicle. One of the most commonly used and effective sound deadening products is mat. Sheets of mat come in various thicknesses and sizes. They are basically a flat piece of a rubber-like material with an industrial strength adhesive on one side that sticks to trunk lids, door panels, floors, and anywhere you want to absorb unwanted vibrations. The material is extremely flexible and designed to contour to the shape of the surface it is being applied to. 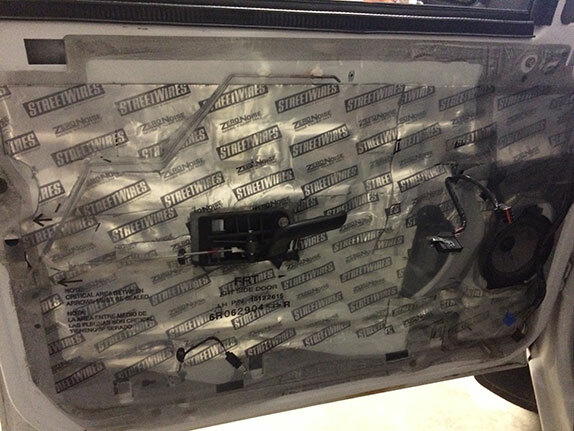 Sound deadening mat is usually sold in kits such as door kits, trunk kits, and license plate kits. Each kit is specifically cut to various sizes to accommodate a specific area. For example, a trunk kit will include larger sizes of mat than a door kit and a door kit will have larger sizes than a license plate kit. There are also speaker kits that are designed for the hole in the door where the speaker is mounted. For larger installations, mat is also sold in bulk sheets. Installation is easy. To install a sound deadening material door kit to a door panel, you would first remove the door panel and any plastic moisture barrier to expose the inner door metal. (Keep the plastic barrier to reinstall after the install is complete) Install mat to the inside of the exterior door skin by passing the mat through the largest hole of the interior frame of the door. Using a roller that can be purchased at any hardware store, work the mat from the middle out to reduce air bubbles and to be sure the mat is fully contacting as much surface area as possible. You may have to cut the sheets of mat down to a size that will allow you to get them inside the door. Cover as much of the inside of the exterior door skin as you can and be sure to stay away from any moving parts of the window mechanism. Once you have as much of the interior door skin covered as you want, then start on the exterior door skin. Be sure to only stick the mat to areas that will be covered by the door panel. As you work the mat onto the door, use the roller to ensure contact everywhere and prevent air bubbles. The mat will flex to most contours but some drastic angles may require a cut or two in order to cover the area. Be sure you DO NOT install the mat on top of any moving parts. Covering the access holes in the door frame is best for maximum sound deadening. If you should need to use these access holes in the future for repairs or service, you can simply cut the mat out at that time. Once the mat adheres to the surface, it creates a bond that is very difficult to remove so be sure you are not placing the mat in any unwanted areas. 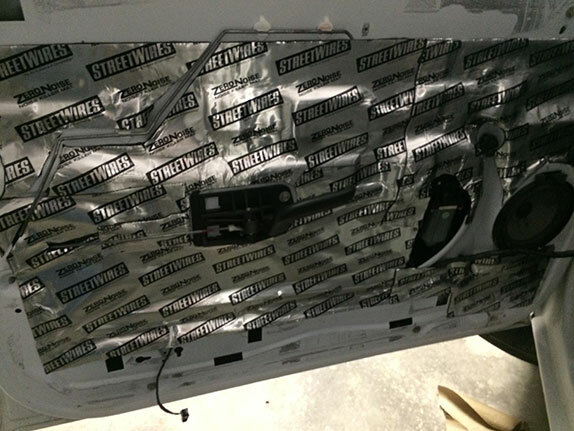 Be sure not to cover any mounting locations (tab inserts, bolt threads, etc…) for the door panel. In this installation, you will notice a channel was cut in the sound deadening mat for the door lock linkage and the door lever linkage. Also, the window motor was not covered so that it could be easily serviced in the future if necessary. Once installed, the rubber in the mat acts as a vibration absorber. Not only does it absorb the vibrations your metal door panel would have otherwise had, it also reflects sound waves to keep them inside the vehicle. To complete the installation, make cuts in the mat to allow wire harnesses, linkages, and any other parts to pop through that need to reconnect to the door panel. Reinstall the vapor barrier and door panel and you are done. For license plates, you would simply install the mat on the back of the license plate itself and sometimes to the area where the license plate mounts to the vehicle. When installing sound deadening mat on the floor of the vehicle, it is best to remove the seats and carpet to access the metal floor. Follow the same process as applying to a door panel and be sure all mounting areas for the seats, center console, etc… are still accessible by cutting the mat around them. Bulk kits are best for this purpose and other larger coverage areas such as roofs. 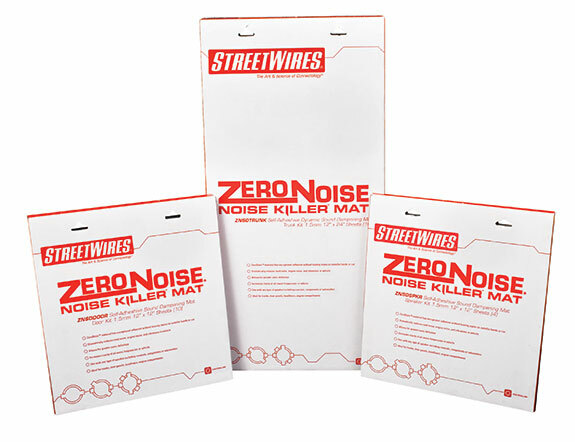 StreetWires® offers ZeroNoise™ sound deadening mat in bulk kits of 1.5mm thickness or 3.0mm thickness. For trunks, sound deadening material trunk kits are usually installed on the inside of the trunk lid, on the floor of the trunk, on the bottom side of the rear deck, and on the inside of the rear quarter body panels. Some people even install mat on the spare tire well under the trunk floor. The key to installing sound deadening mat to any surface is to apply the mat directly to the surface you are trying to prevent from rattling or that is closest to the noise you want to absorb. The more body panels you cover with sound deadening material, the more vibrations it will absorb and the quieter the inside of your vehicle will become. When your vehicle isn’t rattling, you can hear your music better. For SPL competitors, any sound pressure that escapes the cabin of the vehicle through vibrating body panels is hurting your score. Sound deadening material helps to keep the pressure inside the cabin where it can be measured by the RTA (real time analyzer) meter. Sound deadening mat is also used in other non-automotive applications to absorb vibrations and unwanted noise such as on dishwashers, clothes dryers, in the engine bays on inboard and inboard/outboard boats, in generator compartments on RV’s to insulate the noise from the sleeping/living area, and inside walls of home theater rooms to name a few. Sound deadening material also has a thermal insulation value which helps with defelecting heat. Add sound deadening mat to your vehicle’s roof to reduce radiant heat during the hot summer months. Deflect heat from catalytic converter’s and exhaust so it doesn’t raise the temperature inside the vehicle or effect other components of your chassis that may be close by. Over the road truck driver’s can insulate their semi truck sleeper from extreme cold or heat while keeping unwanted noise out to get a good night’s sleep. As you can see, there are countless uses for sound deadening material. Whether your purpose is to achieve better sound quality by reducing unwanted vibrations, achieve better sound quality by keeping noises outside your vehicle from getting in, to keep your sound system’s audio inside the vehicle for increased SPL, or to provide thermal insulation for an automotive, residential, marine, or heavy equipment application, sound deadening mat can be very useful. And better yet, it’s easy to install yourself with some simple tools.